The recipe was inspired by Farm To Market Bloody Mary Pickles. But you can use your favorite Bloody Mary recipe and add the pickles and shrimp. Here’s THE NIBBLE’s favorite Bloody Mary mix recipe. While the top photo shows only 1 shrimp (the original Farm To Market idea was a cocktail garnish), we recommend 3-4 large shrimp (or jumbo, as the budget allows). 2. 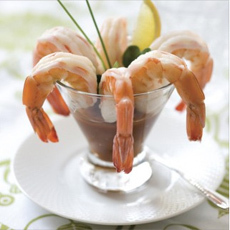 TOSS the shrimp with 1 tablespoon lemon juice in large bowl. Thread 1 shrimp and 1 pickle chip on a long toothpick or cocktail pick. Repeat with the remaining shrimp and pickles. Cover and refrigerate until ready to serve. 3. PREPARE the Bloody Mary mix (or open the store-bought bottle) and combine with vodka. 4. 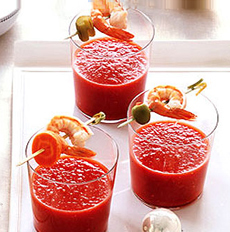 POUR into glasses and garnish each with a shrimp skewer. 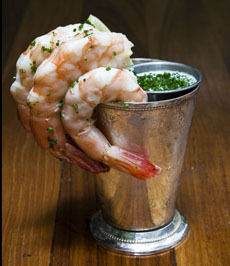 Garnish a Bloody Mary with shrimp—as many as you like (photo courtesy Farm To Market). Center: Use your julep glasses, stemware, or whatever you have that works (photo MackenzieLtd.com). Bottom: More jumbo shrimp, less Mary (photo MackenzieLtd.com).